Update 2018: Chocolat is no longer in operation. Updates to come as to if/when they will re-open. 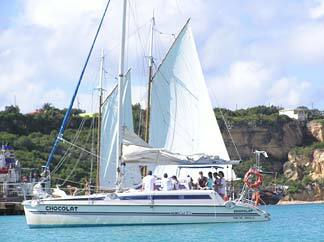 What do "Anguilla tours" and chocolate have in common? 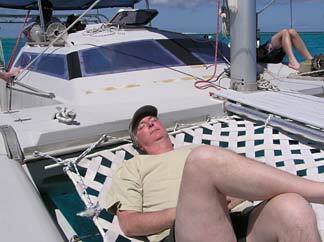 Well, the tour that we took has a boat named Chocolat and both are relaxing, tasty, and fulfilling. Ready for a day of real R&R... discovery and great eating? Aren't we all? Come along then! Our "delicious discovery" commenced in March of 2004. Claire Devener, publisher of Anguilla Life magazine, had recently raved to my Dad about a fabulous day-on-the-sea tour by Rollins Ruan. 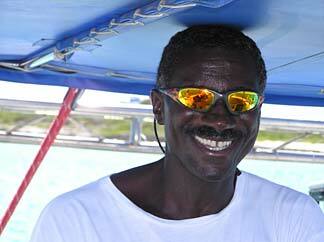 He and his 35 foot catamaran, Chocolat, take you out to Sandy Island and Prickly Pear, stopping for snorkeling and some fine onboard eating. Not many Anguilla tours can promise you great eating, right? Right. But Rollins happens to be married to Jacquie Ruan, she of Ripples restaurant fame. So, my Dad, being my Dad, thought we'd give it a whirl. 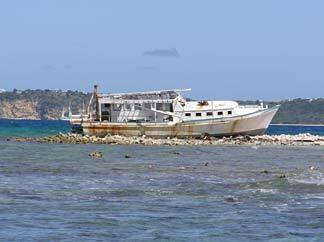 We'd never gone on any "structured" Anguilla tours, but what the heck! "Why not?" So we booked a day about a month before we left and went for it! (They can fill up, especially in-season), so it's a good idea to book ahead. Use the form below to contact them (forms avoid e-mail spambots). We showed up at the site bright and early (or so it seemed, being on vacation). I could spot the boat in the distance. It was majestic... sitting proudly moored out in Sandy Ground's harbor. I couldn't wait to hop on and get moving! Rollins' first priority is our safety. So, he laid down all the "dos and don'ts," in a friendly, lively manner. Then we were quickly on our way. Now for the big question... where to??? The ride over was gentle. We were practically gliding across the water. 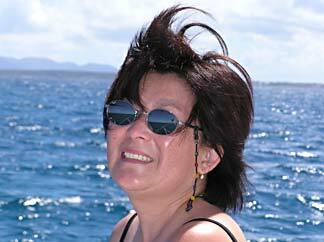 I love boats, so I was having a spectacular time. This is where the good captain dropped the anchor. Looking towards the shore, the water had that inviting shade of turquoise which I couldn't pass up. I had to jump right in! My sister eased her way in a little more carefully, helped by the ever-patient Captain. Many of the other passengers headed in the opposite direction, for what my Dad confirmed was excellent snorkeling. Prickly Pear is supposed to be pretty unvisited. But you can see that a place as stellar as this is hard to keep a secret. But don't worry -- these were the only visitors. Just enough to keep you company. I would tell you how long we spent on the island if I was keeping track. Time really is irrelevant when you're in such a blissful state. Now, if you've ever eaten at Ripples, you know the food is great (article on Ripples coming soon). So we knew that we were in for a treat. In any event, Jacquie lived up to our high expectations. And, as you can see, my sister gobbled like a turkey. 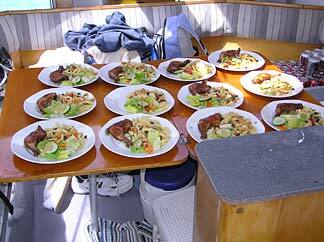 Rollins said that we were very lucky... that HE didn't make the meals. Ha! Ha! First off, there was a fresh, crisp garden salad. Second, a creamy, tasty pasta salad. And then, one of my sister's favorites... BBQ chicken. A seasoned sauce, tender meat cooked perfectly, almost falling off the bone. We really enjoyed that unexpectedly great lunch. And my sister was in a tremendous mood! hoping the day would never end. My sister, mom and I continued to do what we did so well... nuttin'! But see my Dad there? Well, it's not natural for him not to move for more than 15 minutes. So he soon left his spot in the sun to check out the snorkeling action. Many others swam in the opposite direction, towards shore, where there's a little restaurant and bar. My Mom, Yuki and I chose to bask in the sun. While doing so, we noticed quite a large, shipwrecked boat. It had been there for quite a while, judging by the rust. Then he explained that a hurricane had literally plucked it from Sandy Ground and dumped it here. The boat was apparently so badly damaged that it was not worth salvaging. 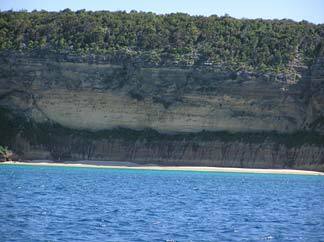 It was fun to imagine being shipwrecked on such an island... as long as there was a nice little restaurant and a good hotel of course! Ha! Ha! All too soon, it was time for one last stop. One which I wasn't looking forward to, our last one. 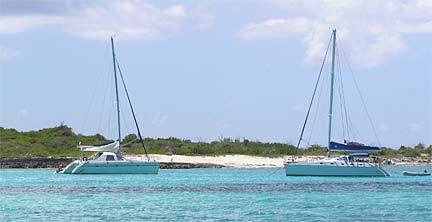 We lifted anchor and headed towards Sandy Ground, our point origin and our ultimate destination. And keep your eyes peeled! We even saw a sea turtle. The trip began there, and it ended there as well. Too bad. It went by so fast. Yet it seemed like we had experienced so much. All too soon, Captain Rollins was helping us off the boat. We thanked him for such a "life memory day" of eating, swimming, snorkeling, and discovery. Normally my Dad would scoff. 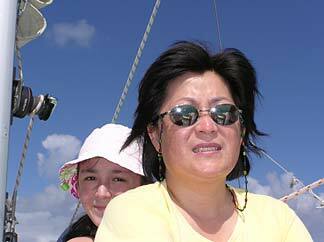 And my Mom would be terrified to be on the open seas -- see how terrified she looks? Instead, this trip will always be remembered by our family. As of 2018 Chocolat is no longer in operation.